We believe that children are born with a fundamental awareness of God’s presence and with the potential for meaningful spiritual experiences through God’s grace. Children from ages 3 – 11 meet in three classes according to age, one preschool class and two school-aged classes. Parent and other volunteers from the congregation act as teachers and classroom assistants. Sunday school for children is one hour, from 11:00-noon. Through Bible study, interactive activities, discussion and reading, they gain greater depth of knowledge about Jesus and the Biblical story and the beginnings of ethical and theological understanding. 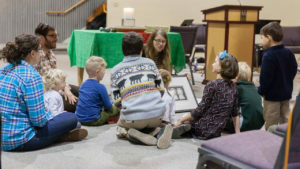 All ages of children participate in worship, both with adults, and with each other during their classes. In worship we have an area called our “Prayground” stocked with crayons, paper and soft toys for quiet play and coloring. there is also a staffed nursery where parents are welcome to leave their small children with caring and responsible youth and adults. Junior Youth (Middle School) and Senior Youth (High School) also gather for Sunday School. They each meet in their own space with a teacher who engages the youth in discussion and activities on a range of topics from Bible study to healthy sexuality to Exploring (Ana)Baptism to social issues and current events. Youth also meet periodically outside Sunday morning for fellowship and education. Some favorite activities in the past have included game or movie nights, Whirlyball, ice skating, archery, bowling, and much more. Throughout the year youth are encouraged to participate in service projects, Camp CAMREC, and the Mennonite Country Auction. 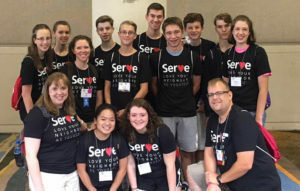 The senior youth also work to raise money for the bi-annual Mennonite Youth Convention, which happens in conjunction with the MC USA Assembly. Each youth has the opportunity to be paired with an adult mentor from the congregation in SMC’s mentoring program. At SMC, we are intentional in ministering to families with children through our worship, fellowship, education, and service opportunities. Sign up to receive a “Midweek Message” from our Pastor for Children, Youth, and their families. 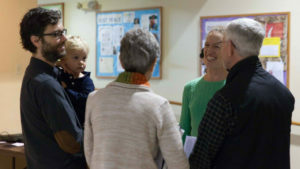 Each week’s message includes ideas for practicing faith in the home, reflections on how current events intersect with family life, and resources for parents and other caregivers of children and youth.